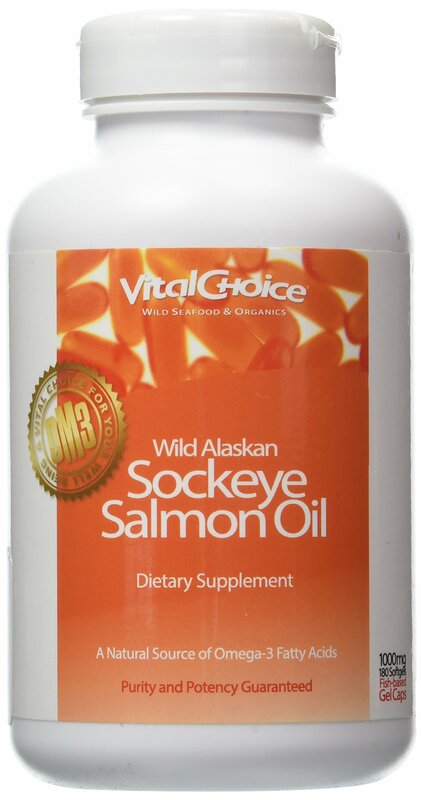 Vital Choice Wild Alaskan Sockeye Salmon Oil is a whole, unrefined omega-3supplement of rare quality, produced by America's premier wild seafoodpurveyor. Its purity and potency is certified by NSF, and Vital Choice SalmonOil was the world's first fish oil to earn independent certification (from theMarine Stewardship Council) as a sustainably produced supplement. Unlikestandard fish oils, which come from various sources and must be chemicallyrefined at high temperatures to ensure purity, Vital Choice Salmon Oil comesfrom one of the world's purest fish and retains its full matrix of omega-3fatty acids, vitamins, and antioxidants. In addition to providing ample omega-3s, Vital Choice Wild Alaskan Sockeye Salmon Oil is rich in naturallyoccurring astaxanthin, the powerful antioxidant responsible for its deeporange glow. And unlike many salmon oils, ours comes from wild salmon, notfrom industrially farmed salmon. Worried about fishy aftertaste? Our oil ismade exclusively from fresh, gourmet-quality wild sockeye salmon, for a fresh,appealing flavor and minimal "repeat". It's the next best thing to gettingyour omega-3s from wild Alaskan salmon ... and your body will know it.